There are still many collecting opportunities at and near known agate fields. Some believe all the good material was picked up years ago and is sitting in a collection somewhere or a storage unit or maybe even sent off to a landfill. This is not usually the case. Exciting finds are still out there. Chances to unearth new and different material are just over the hill from the deposits that early rockhounds first discovered. Every rainstorm uncovers new clues to agate pockets, veins, or nodule beds. For years, old-timers have said, “It’s all gone. There’s no more. Don’t waste your time.” Nonsense! Many of the early agate hunters were surface pickers. Plume, sagenite and other better agates were the first to be picked up. Over the years, agates left by the early rockhounds were swept up by those who followed. In some cases, virtually every piece of chalcedony was taken, which eliminated the only clues for the rockhounds who followed. Rain and wind erode the surface dirt and expose heavy chunks of agate. For agate collectors, these are clues to what lies underneath. I learned a valuable lesson while hunting agate with Gene Mueller in Mexico. Gene owns The Gem Shop in Cedarburg, Wisconsin, and is an excellent source for Mexican agate and materials all over the world. He also owns claims in Mexico. I wanted to tell him, No, Gene, this is some awesome plume agate; Why can’t I pick it up? I carefully moved larger rocks to the exact spots where I had found each piece of agate, and I placed the pieces of agate on the tops of the larger rocks. Gene told me to comb the area and do the same with any more that we found. After 15 minutes or so, we had a number of pieces of plume stacked up. We then began digging just under the marked rocks, revealing nearly twice the plume we had found on the surface. What Gene taught me that day has helped me discover some of my best agate. While hunting in Maricopa County, some time ago, I found a fist-sized piece of golden plume. Excited by my find, I marked the spot and looked for more, but without any luck. There had to be other similar material nearby- uphill, downhill- somewhere close. I crawled around looking for the smallest chip. Possibly I’d find a discarded chip from a rockhound who went through this same process 40 years ago. However, I didn’t locate any chips or chunks, so I went back to where I found my treasure and began to dig. Only 10 inches down, I hot a volcanic flow. I carefully turned the dirt with my pick and shovel, listening for the ringing sound one hears when metal strikes agate. I looked for the irregular shapes and textures of the agate that is typical of that area. Twenty minutes later I still hadn’t found anything. Could this beautiful piece of plume have been dropped by a rockhound years ago? It seemed to me that this piece was much too good to discard. Therefore, it must have been uncovered by erosion. I kept digging, continuing uphill. Then I heard that welcome ringing sound! I unearthed a pocket of 25 to 30 pounds of fabulous black and gold plume. Prospecting should start in low-lying areas, because heavy agates and other good cutting material wash downhill. 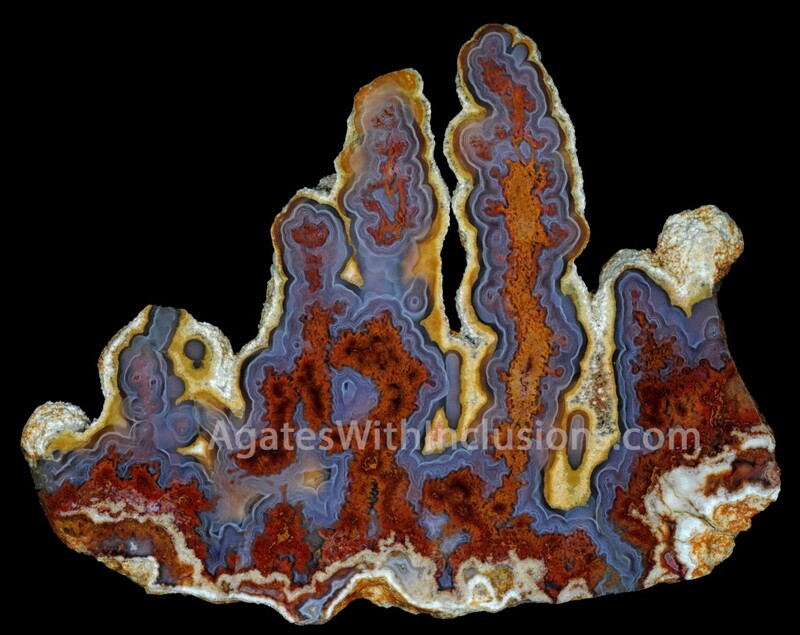 In most agate fields in the Southwest, surface agate is usually close to the source. When you find a keeper piece, you are probably near the where it formed. An agate field is generally volcanic, consisting of basalt, rhyolite, andesite or dacite. Agates not found in these volcanic area could have been washed down from a great distance away. For instance, Lake Superior and Montana agates traveled miles from their points of origin. The first signs of the “red-top” agate I found, were only 50 feet downhill from the place it was formed. I was prospecting a heavily faulted area. The agate seams (or veins) came to the surface throughout the area, all lying in the same general direction. Most of the material didn’t have the type of inclusions I was seeking. Once the first piece of red-top was found, I went up the wash a few feet and found another chunk. As I continued moving upward, I found more and larger pieces. When I came to a small wash that fed the larger wash, I ran out of material. In fact, this smaller wash was a fault that lay in the same direction as the other seams in the area. I moved some surface dirt at the junction of the two washes, and I revealed a 6-inch-wide vein of beautiful blue agate with red inclusions. The vein continued up this smaller wash for more than 40 feet. I collected some of the better material in druzy-lined pockets, or vugs, along the way. Prospecting is something we can all enjoy. A tiny chip of quality rock can often lead to a successful day. That one larger piece that can make your trip worthwhile, may lie just inches below the surface. Dig on!